K6APW CA Thanks! What a really tough test with an unaided 10 Hz resolution transceiver. K5CM S5 to S8 W6OQI S9+ to S6. K6YAZ CA Connie; thanks for another interesting evening; too bad that I was tired! Hope this isn't too late- I just got home. Good copy on forty- reasonable stable. KD2BD NJ Very good signals were received during the FMT period. During the "key down" period- your on-air frequency was determined by measuring the frequency of my receiver's L.O. while it was phased locked to yourtransmitted carrier minus exactly 1000 Hz. During the CW periods- I plotted received audio against a 1000 Hz standard on an oscilloscope- and fine tuned the L.O. using hand capacitance to produce a stationary display on the scope while recording frequency readings on paper. Quite a challenging exercise! W6OQI CA This three frequency format certainly is more challenging but fun to do. I will think it was even more fun if I am close. There were some intervals during your long transmission when Doppler was not too bad. K6OQK CA Connie your signal was very stable tonight. I had a sneezing fit and missed Marv's 15 second key down run. This was a fun change of pace. VE3OAT ON Rats! I made some sort of reading mistake on your first (short) key-down transmission so no result there. W6OQI was "weak but readable". Thanks for the FMT Connie. N8OB OH Another try from this neck of the woods. Very nice signal this evening. 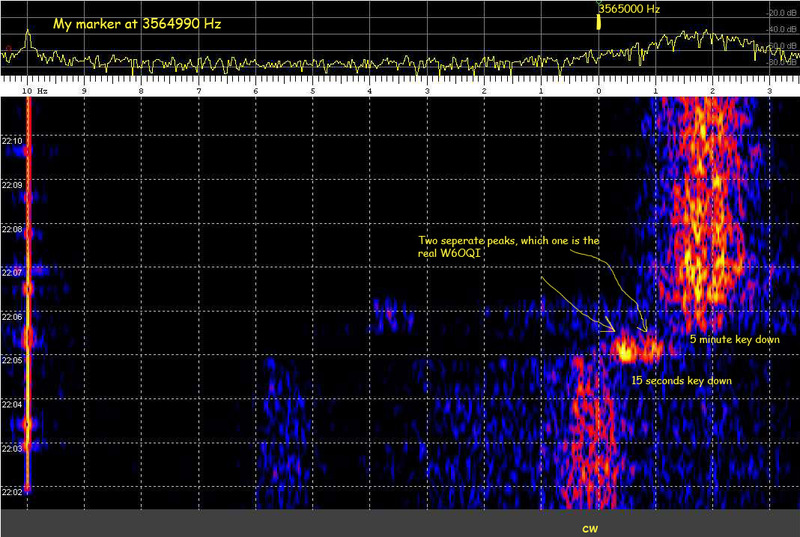 W3JW VA Local thunderstorms were producing static bursts well over S9. Doppler effects were significant on all test signals. Most results were obtained with SpecLab. Was able to make counter measurements on the 40 meter long carrier test. This format is definitely more difficult than the previous one. WB0UIR AZ Hank says Same old National receiver and HP counter. AA4RP GA K5CM - GOOD SIGNAL S9 + 20 db W6OQI - WEAK QSB HEAVY QRN. SL capture of W6OQI by K5CM. Considerable static Doppler was noted on Marvin's 80 meter signal here in Oklahoma. Marvin started the cw call up on 3565000.218 Hz then moved up to 3565001.054 Hz for 15 seconds, then finished the run by moving up to 3565002.154 Hz for 5 minutes. Congrats to WB0LXZ, K6APW, AA4RP, and W3JW for getting all six readings to better than 1.3Hz. Stations copying K5CM run to .1Hz or better. Stations copying W6OQI "West coast run" to .1Hz or better. A HP-Z3801 GPS clocks a HP-3336B. A small 10 db transistor amp follows and drives a 12BY7 / pair 6146 in a TS-830. Then to a Drake L4B at 300 watts output except on 30 meters where the power is 75 watts.